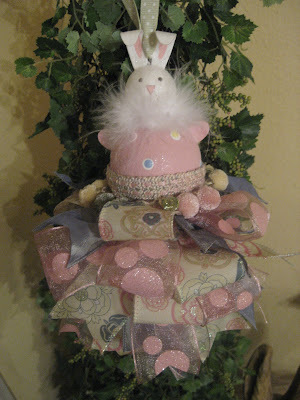 Kristen's Creations: Spring Rabbits...Easter is Coming! Hey Guys! I hope you are having a great start to your week! Looks like spring is on the way! The weather is getting so much warmer here in Arkansas. Tomorrow it's supposed to be in the 70s! YAY! I'm sooooo ready for warm temps. I can't wait to get flowers planted on the patio we built last year...and our new trees will start blooming soon too. We bought them last year after the season, so I am anxious to see what they look like in bloom! I wanted to show you some of my rabbits. Now you have all seen this arrangement a million times, but every time I post it it's always just a little bit different...lol. I found this cute rabbit at Market in January and ordered some smaller ones to sell in my Etsy store. Isn't he cute? I ended up adding the green cabbage roses and little white daisies to springorize it just a bit more. 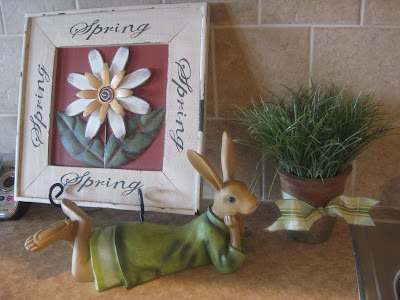 I also ordered this cute bunny at Market, he watches me wash dishes...lol. I found the "Spring" sign at Hobby Lobby last year. I have had this little guy forever! He's been knocked over a few times, but he glues back well. The rest of my rabbits stay out all year. 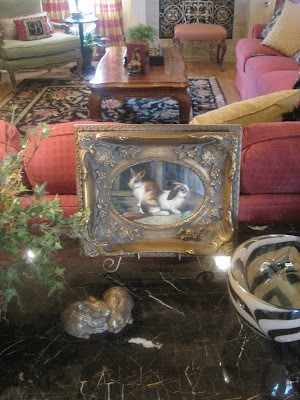 This little rabbit oil painting sits behind the love seat. It's one of my favorite accessories and has been here since we moved in. 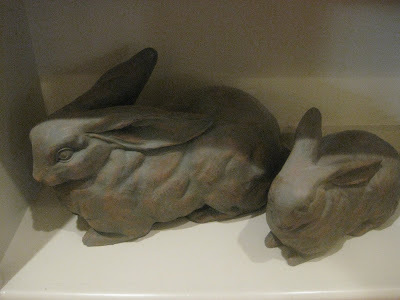 I bought these little guys at Kirkland's several years ago, they sit in my bookcase. This was a box, but I broke the lid and it became a container. See the little rabbits on the bottom? 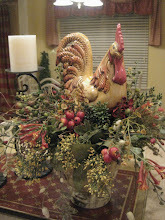 I am planning on participating in Table scape Thursday so I will show you my springy table then. I will also be showing my spring terrarium...hint: birds and butterflies. Over the past few days I made a few more items for my Etsy store. These little rabbits are just adorable! I am really enjoying my new job! 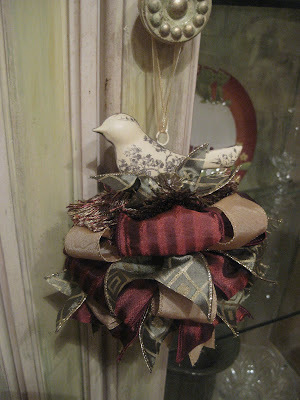 I worked today doing some custom designs and more arrangements for the store. I will take more pictures...this store is just beautiful! They have so many great items. It's still funny how things work out! Now I have extra money! Hubby is afraid I will be bringing new things home...we'll see. ;) I took this picture as I was running out the door today. Please check back on Thursday for my little spring tablescape and terrarium!! Have a great week! 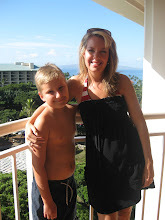 Your blog is probably one of my favorites! I love the bunny that watches you wash your dishes!! You have beautiful accessories! Just beautiful, Kristen! 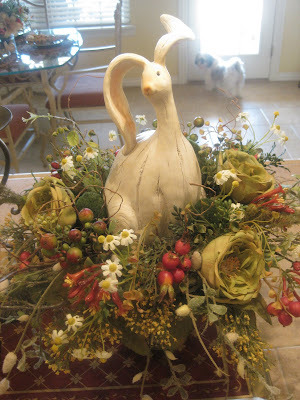 I love the arrangements with the bunnies and how they "spray" out. I keep my bunnies out all year, too! Can I ask where you got that lounging bunny by your sink? He is just wonderful! I'm tellin ya, you should be selling those floral arrangements on Etsy! Can you tell who would be the first to buy one? You just can find original arrangements like that around here Kristen. You are immensely talented. But I've told you that about a million times haven't I? Ha! 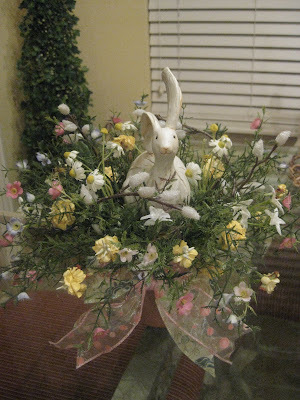 Oh your bunnies and arrangements are so precious. Love all of them. My poor bunnies...don't know if they are going to see the light of day this year! Well bc your Blogs so beautiful and happy and you make lovely things I will have to follow you!! Come over and see my page! I look forward to more posts from you. 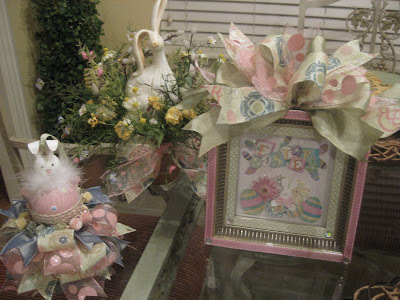 Kristen your bunny decor is precious! You really found some adorable new ones to display throughout your home. 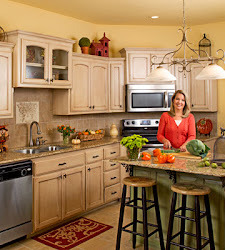 The kitchen counter vignette really makes me smile. 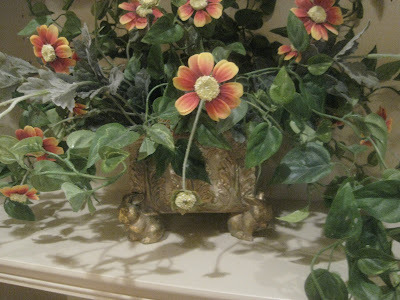 Your flower arrangements are beautiful! I don't have any bunnies. I need to work on that. I'm ready to see your pretty table too! Spring is on the way. It is warmer here today as well. The bunnies around your home are wonderful too. 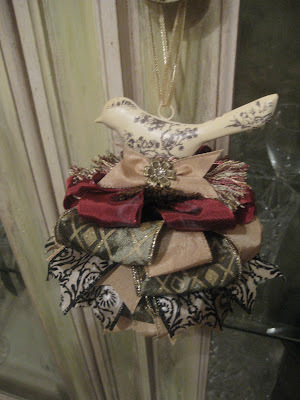 The new items you made for your Etsy store are fabulous! It looks like you have found the perfect place to work and will have lots of fun using your talents there. OH Wow!! 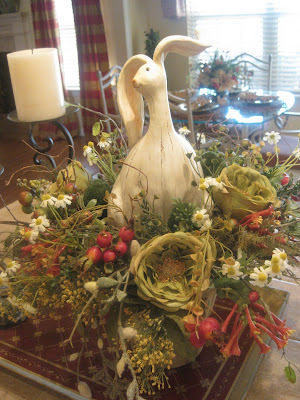 Your floral arrangements with the bunnies are so stunning.... you have done an amazing job on creating them.... 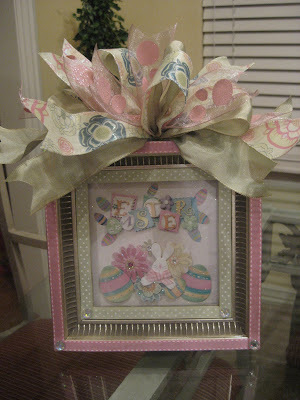 I so wish I had that kind of talent.... love all the other Spring goodies as well. I love all your cute bunny stuff! I have been wanting one of those paintings like you have in the gold frame, but they are always so expensive. May try to see how one printed out looks and frame it. I love all your bunnies and your clock. 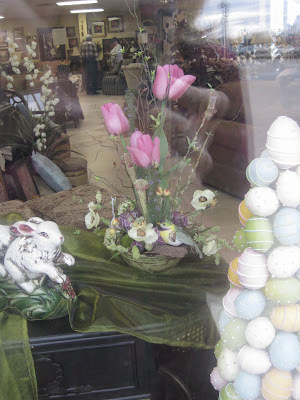 Let me know when you list those bunny arrangements in your store. Love them. Hi Kristen...so nice of you to stop on by! I just love your bunnies all over your home. 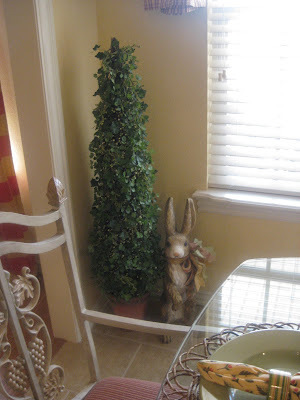 The one in the dining area that sits on your floor...he looks like he is peaking out from behind that tree. 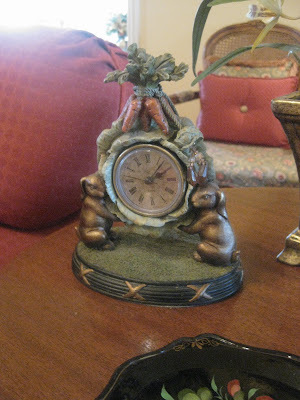 I love the whimsical style of these little guys! So cute!! Oh... and love your new Etsy creations. How fun to have a job doing what comes natural to you! What a blessing! Have a great day! Hugs! 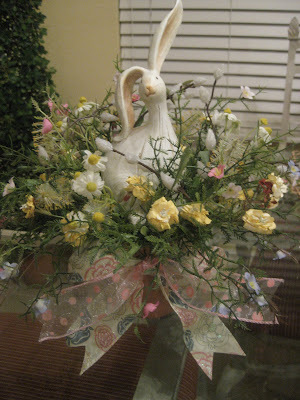 I love all your lovely table tops and the bunny with the big and cute ears is just to cute. You have done a good job with the flowers and your post spells spring for sure. I love your rabbits...all of them. The new store items look great too. Did you get any of that horrible weather? Your bunnies are adorable and if you decide to sell those arrangements on etsy... well, you better email me and let me know, because I will be ALL OVER it!!! !